P&G spend 9–11% of their sales budget on marketing, a huge sum of money which hasn’t wavered in the face of recession or poor sales results. I’ve heard frequent criticism of the ‘flabby’, non-ROI driven tactics deployed by the company, but is Mr McDonald over-rating social media as a “free” resource that can achieve the same as 1,600 people? Time will tell, but what this does illustrate is the approaching shift in resources towards digital marketing. I really do believe it behoves all of us working in the marketing sphere to get a better grasp of the tools available, and how both we and our clients can benefit from their use. So what’s so good about social media? It’s measurable. You can easily see how many likes you have on Facebook, how many followers on Twitter, and how many connections you have on LinkedIn. 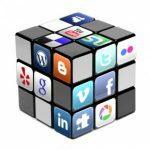 You can also track 12 different social media platforms at once using the (also free) Klout website (http://klout.com). You can’t fake it. If you’re really passionate about what you do, and what your customers think, social media is ideally positioned to help you narrowcast at a grassroots level. On the other hand, if you’re a modern day Gerald Ratner, your lack of authenticity will show. When integrated with traditional media it provides a cross-channel, cross-experience and cross-audience campaign which – like P&G’s wildly successful Old Spice advert – can have a dramatic effect on sales. The main negative levelled at social media is that most marketers (as yet) haven’t seen a direct impact on sales, but arguably they’re missing the point. Alex Pearmain, head of social media at O2, says it’s in engagement and not direct response where social media will prove successful for marketers. He adds: “Social media can make money, but businesses need to have a broader view of how it can do this. If someone invests in direct response and wants a return within 10 days, I would query the use of social media. The other issue – for me, certainly – has been the ever increasing number of social media platforms available. Here for your viewing pleasure are the main ones that I’m aware of, along with my – highly inexpert – feedback on using them! LinkedIn – My personal favourite, with the discussions being fantastic for both market research, gauging customer opinion, and yes, even direct sales! Facebook – Great for connecting with existing customers and industry peers. Haven’t yet nailed getting the world at large to take notice! Twitter – Again, great for engaging with your peers. Google+ – I haven’t really given this a proper shot yet… Too early to tell. It seems pretty similar to Facebook. Foursquare – I don’t really see this as a business app but it’s good fun. YouTube – Video content is surprisingly good for SEO, and this is the home of viral campaigns too. One area I’m really going to push in 2012. Instagram – This is a photo sharing app that publishes your photos to most of your social media platforms. Handy! Tumblr – An easy to set up and use website for blogging. I’ve just started on this but it’s great for sharing content. Pinterest – The hottest thing in the world right now! I’ve just signed up. Very excited about using this to share content and (hopefully) drive traffic to our websites. I’m aware I’ve missed out loads but that’s the point – you can’t possibly expect to get great results from each one. Each one you sign up to means a little less time on the others, which probably means poorer quality and less frequent posts. I think the answer here is to give them all a fair trial and then cut back to the ones which show the most promise. So in conclusion, I don’t think any of us can afford to ignore or avoid the social media explosion, whether it’s from the perspective of growing your own business, or advising your customers on achieving the best results from their cross-channel campaigns. Better to be driving the band wagon than merely riding it!